We're a demanding generation judging by the number of VOD TV services that are now available. Top Up TV Anytime is one of the cheapest subscription options at £10 per month, and to woo more customers, it now rides on the back of some rather cool hardware. 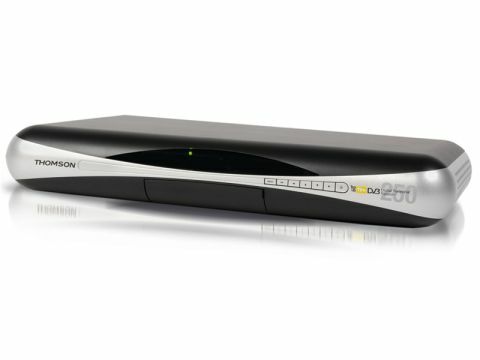 The Thomson DTI 6300 is a well-specified Freeview PVR with two DVB tuners and a whopping 250GB hard drive. The TOTV Anytime service is activated when you insert the supplied card and call the number which appears on screen. This then gives you a choice of 'premium' TV channels like MTV and UKTV Gold (Okay, so they're not that exciting but it does expand your viewing choice). With curves at every corner, the box is styled to match the SkyHD unit. It uses pretty-much the same remote control design too. Easy to use. It took me just five button presses to set the Thomson to record every episode of Flog it! 250GB should be enough room for even the most dedicated telly addict. One thing this box lacks is an HDMI output, which therefore precludes any upscaling action and limits you to swimmy Freeview picture quality. The poor selection of programming offered by TOTV Anytime is also a limiting factor. But even without the subscription, this is still a fine PVR.